This regular market is being held indoors over the winter period, which is very welcome news with the weather we've been having! It's not too far from Christchurch, and you can find a great selection of handmade goods, including candles, clothing, children's toys, jewellery, and also fresh produce, including organic fruit, cheese, bread, meats and fresh flowers. There is something for everyone, including hot food and a bouncy castle. Formerly known as Craft 2.0 Christchurch, A Craft Affair has grown from the success of these markets, and we now have our very own fair. Regular attendees will already know about the great selection of high quality handmade crafts available. If you haven't been yet, it's well worth a visit. If you're not a fan of crowds, I'd recommend coming a bit later in the day, as it usually quietens down a bit as the day goes on. You can find out more on the blog, and even plan your shopping, as interviews with all the stallholders are being put up each day - keep an eye out for mine. 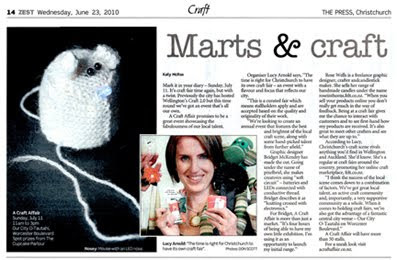 If you happen to have a copy of today's Press, have a look at page 14 of Zest, there is a feature on A Craft Affair, including a quote from yours truly! For a readable version, click here. For the first time, Rose in Thorns will be hitting the road, and Aucklanders will have the opportunity to peruse my wares. 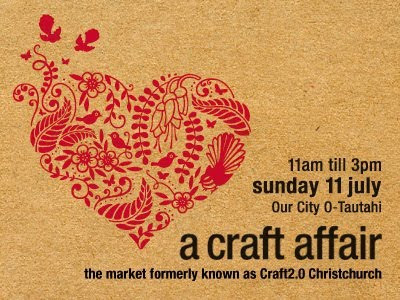 This will be the first ever Auckland Art & Craft Fair, a one of a kind, special event designed to showcase a selection of New Zealands best independant and contemporary designers, artists, and crafters. 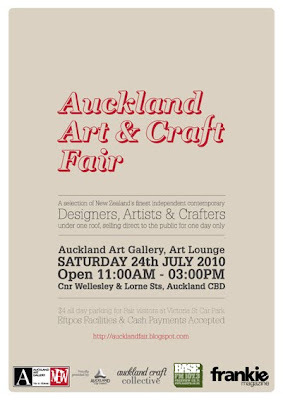 It will be held at the Art Lounge of the Auckland Art Gallery, from 11am till 3pm. For more info, and artist interviews, check out the blog. You can read my interview here. Maybe a road trip over from the coast is in order...? Mel - will definitely keep you posted on how they go – well I hope! It sounds busy and exciting! The best of luck to you at each event.